Irasec et University of Washington Press, Washington, décembre 2016, 312 p.
This is the first book to focus explicitly on how China's rise as a major economic and political actor has affected societies in Southeast Asia. It examines how Chinese investors, workers, tourists, bureaucrats, longtime residents, and adventurers interact throughout Southeast Asia. 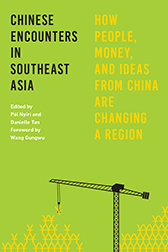 The contributors use case studies to show the scale of Chinese influence in the region and the ways in which various countries mitigate their unequal relationship with China by negotiating asymmetry, circumventing hegemony, and embracing, resisting, or manipulating the terms dictated by Chinese capital. Pál Nyíri is professor of global history at Vrije Universiteit in Amsterdam. He is the author of Scenic Spots: Chinese Tourism, Cultural Authority, and the State. Danielle Tan is research associate at the Institute of East Asian Studies (IAO-ENS Lyon), France, and at the Research Institute on Contemporary Southeast Asia (IRASEC, Bangkok). The contributors are Aranya Siriphon, Caroline Grillot, Caroline S. Hau, Oliver Hensengerth, Johanes Herlijanto, Hew Wai Weng, Weiqiang Lin, Chris Lyttleton, Kevin Woods, Brenda S. A. Yeoh, and Juan Zhang.